Good thing the universal DH isn’t being adopted this year, huh?. 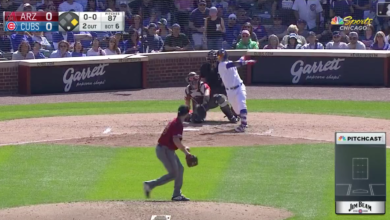 A day after nailing a hole in one on the golf course, Cole Hamels lambasted a dinger to center to give the Cubs their first run. And if that wasn’t enough, we got the pleasure of hearing Cubs bench coach Mark Loretta doing his best Chris Berman impersonation on the broadcast. “Call it, Mark,” Len Kasper encouraged. Yes, he said “back” nine times. I counted.